Interaction with a remote team of robots in real time is a difficult human-robot interaction (HRI) problem exacerbated by the complications of unpredictable real-world environments, with solutions often resorting to a larger-than-desirable ratio of operators to robots. We present two innovative interfaces that allow a single operator to interact with a group of remote robots. 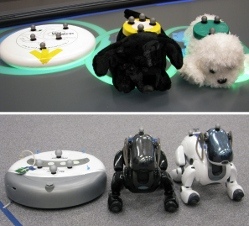 Using a tabletop computer the user can configure and manipulate groups of robots directly by either using their fingers (touch) or by manipulating a set of physical toys (tangible user interfaces). We recruited participants to partake in a user study that required them to interact with a small group of remote robots in simple tasks, and present our findings as a set of design considerations. Download the Touch and Toys: new techniques for interaction with a remote group of robots video file.